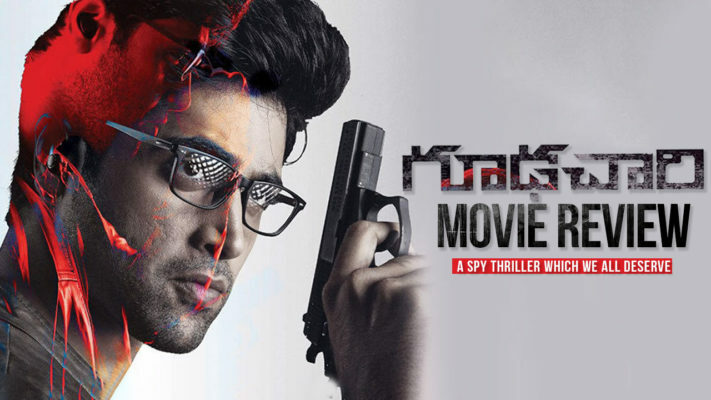 Goodachari had a lot of hype surrounding it as it is a spy thriller, which is pretty rare in Telugu cinema. So I went in pretty sceptical of the quality of the film, but within the first five minutes, I was convinced that it deserves all that hype and more. This is the kind of commercial cinema that the Telugu audience deserves, as it is the kind of cinema that needs to be hailed as the best we have to offer. Now that I have spoiled my review of the movie, I will tell you what I liked about the film. The movie begins with a brief montage of the childhood of our protagonist and does all the set up that any character-based spy thriller can ask for. Essential elements of spy films, like the Bond films to the recent Kingsmen series, are sprinkled throughout, with a tinge of good old Indian sentimentality to give it flavour. I was a little worried when the first act gave me a little too much of ‘The Kingsmen’ feel, but I was soon reassured when I saw where the plot was heading. The script is as tight as it can be, all the plot points and twists are very well mapped out and the effort put into the planning shows. Adivi Sesh, who is the lead and also wrote the film deserves a lot of credit for his dedication to the quality of writing and attention to detail showcased here. Even things that seem like plot-holes are there just to misdirect the audience and explained later. When it comes to the technical aspects, the cinematography by Shaneil Deo is just top-notch. They very accurately emulate the style of the most recent spy films like Skyfall or the Mission Impossible series, by using a lot of establishment shots and exquisite use of the sleek sets. That is another aspect that makes Goodachari stand out is the production design. The production design by Shivam Rao, who had previously worked on Mahanati, is just pure eye-candy. I do not understand how he managed to make the movie look so expensive with the budget he had, but he aces it flying colours. Related to the aspect of production design, the CGI was very well integrated into the film, except for some instances of blood splatter that looked pretty unconvincing. When it comes to this, I would have preferred practical blood than CG blood, but that is just a personal preference. The editing by Garry Bh is crisp and really makes the story coherent enough for you not to ever lose track or interest in the plot. The music when it comes to songs is spare, but enough for the tone they were going for. When it comes to the BGM, this might be one of the spots where I might have a negative point, because it was a little overbearing sometimes. Don’t get me wrong, the score was really good and was perfect for the mood and pace of the film, but I just hope that they had used less of it in some really intense moments, which would have lent those moments with more gravitas. I did not see a misstep in the way the movie was soundly designed. The fight choreography and stunts in the film were almost flawless. They are not exactly realistic, but that isn’t what you are looking for in a spy thriller. I was looking for believability and I was pretty convinced by them. Finally, the director Sashi Kiran Tikka using all these amazing artists creates a really well-balanced spy thriller we will surely remember for a long time. The acting across the board is really commendable and the standouts were Supriya Yarlagadda and the always dependable Prakash Raj. Sobhitha Dhulipala and Madhu Shalini play their parts really well and convincingly. When it comes to Adivi Sesh, overlooking a couple of really emotional close-ups, he was great. He was especially brilliant in the fight sequences. Seems like he put a lot of practice into getting his movements exactly right. There is one cast member who is supposed to be a surprise and I am going to keep it that way. But, I really don’t understand how they kept that a secret and that person is really good at their role. The rest of the cast is really well cast in their respective roles. In conclusion, it is refreshing to see such great films coming out of the Telugu film industry. It is our job as the audience to go out there and vote with our money. The more money that movies like Goodachari makes, we will be sending out a message saying that this the kind of quality filmmaking that we would like to see. So, I urge each and every one of you guys to go out there and watch this gem of a film that is Goodachari. [VoxSpace Life] Kolkata Medical College Hunger Strike : Do The Principles Of Our Forefathers Still Work?